In response to last week’s commentary opposing the proposed Purple Line, Richard Parsons, vice chair of the Suburban Maryland Transportation Alliance, describes why it should be built. As Gov. Larry Hogan weighs his options on the Purple Line, and opponents ramp up their efforts to defeat if, it is important to keep our focus on this project, not sweeping generalizations about transit in general that have little bearing on this case. With construction slated to begin later this year, and significant transportation and economic development benefits at stake for our entire region, there is a strong case to be made for the Purple Line. Gov. Hogan and his team are right to look for additional cost savings, but their decision on the Purple Line itself should be based on its merits, not the questionable arithmetic and general philosophical aversion to transit that underlies some of the arguments Randall O’Toole and others are making recently. The naysayers are ignoring certain key facts, but the governor and his team need to look at the whole picture. To begin with, the Purple Line is nearing the end of a marathon federal approval process that has taken decades. Cancelling this project now – when it is literally at the finish line — would have drastic financial consequences for the state of Maryland, including the loss of roughly $900 million in federal funds already committed to the Purple Line. The federal funds are specific to this project, and would simply go away if it’s cancelled, to be spent on other transit projects in other states. This is a point even the opponents have conceded. What they don’t seem to grasp is that this would not only hurt our local economy, by shifting thousands of construction jobs and billions in economic development out of our region, it would also hurt taxpayers. The Purple Line won this $900 million in federal funding because it outperformed all other transit projects in cost-effectiveness. So why should Maryland’s governor turn down these federal funds so they could be spent somewhere else, on a less cost-effective project? The money will still be spent, just less effectively. What opponents are also missing is that it’s not just this federal funding we would be losing. In his commentary, Dr. O’Toole gets his math wrong when he states (incorrectly) that Maryland would have to spend $1.5 billion to secure this $900 million. In fact, the State’s funding share for the Purple Line is $300 – $500 million. The balance is other project-specific funding the state would leverage through a public-private partnership, and that additional $900 million in private funding also goes away if the Purple Line is cancelled. Thus, a large majority of the project’s funding – $1.8 billion of the $2.4 billion total – would not be “saved” if the Purple Line is cancelled, only lost. When you look at the whole picture, the state’s $300 – $500 million share looks a lot better from a financial investment standpoint, and it’s leveraging more than three and a half times as much from other sources. There are other major economic downsides from cancelling the Purple Line. It would undermine the state’s credibility among investors in future public-private partnerships, which we will need in order to address other critical transportation bottlenecks. If the Free State pulls the plug now on its first major public-private partnership, after several top transportation firms have already sunk hundreds of millions into their Purple Line bid proposals, how likely would those firms be to take on similar risks in the future, once Maryland proves to be a less reliable partner than Virginia? The Governor’s decision will also have a major impact on local real estate markets and property values and, here again, cancelling the Purple Line will prove costly. Hundreds of millions in private sector investment has already been made in properties along the approved alignment. O’Toole and other skeptics can make all the vague references they want to about other markets where light-rail did or didn’t foster economic development, but we don’t have to speculate about the Purple Line’s effects. At least 31 large-scale economic development projects are already in the pipeline as a result of this project. This isn’t theory, it’s a fact. The nearly $10 billion increase in the local property values, and major expansions in our economy and tax base, are not just projections, they’re already being felt. All of this is at risk if we pull the plug. Even if the financial and economic cases for the Purple Line were not strong enough to win the day – and they are – the transportation benefits are more than sufficient. For starters, the Purple Line’s regional “network effects” are compelling: Joining the two ends Metro’s Red Line with the Green and Orange lines, MARC lines and local bus lines. It transforms our current disconnected set of rail lines, all of which run into DC, into a robust suburb-to-suburb network that matches current commuting patterns. It will attract over 28,000 new riders to the region’s transit system, not just the 17,000 new transit riders along the Purple Line corridor that O’Toole includes in his calculations. In this highly-congested inside-the-beltway corridor, not many other options exist, and the daily ridership forecast of 69,000 riders is likely to be met or surpassed, based on previous forecasts in this market. When it comes to travel time savings, the arguments opponents are advancing suffer from massive problems with selective use of data. True, the travel time savings from Bethesda to New Carrollton are not much, but end-to-end riders are a tiny fraction of the total riders on the Purple Line. Far larger numbers will be going from Bethesda to Silver Spring or College Park, or from College Park to New Carrollton, and for these riders the travel time savings are huge. Trips from Bethesda to Silver Spring go from 39 minutes on Metro to just 9 minutes on the Purple Line. Bethesda residents could get to the University of Maryland’s College Park campus, without sitting in Beltway gridlock, in just 39 minutes using the Purple Line, which includes new stations on-campus. That same trip would take 56 minutes by Metro, and you’d have to catch a shuttle bus to get to campus. 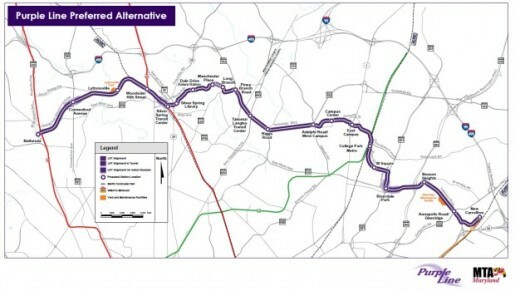 Going from College Park to New Carrollton would take just 16 minutes on the Purple Line versus 56 minutes on Metro. Those are the very real travel time savings O’Toole and other opponents conveniently omit when they focus only on the insignificant share of Purple Line riders who travel end-to-end. When it comes to congestion relief, it’s true that the Purple Line has a relatively small impact on congestion levels region-wide. Obviously, we need a lot more capacity throughout the region, but the Purple Line does have a positive effect on congestion in the corridor it serves. The number of failing intersections in the morning peak period drops from 9 to 3 with the Purple Line, and from 15 to 9 in the evening. In a corridor with few other options, any new capacity helps. ← Foreign Films: Why does Hollywood always re-make perfectly good movies?